WOW ! Where did that first year go to? Celebrate the 1st birthday of your little one. Use the 1st Birthday Pennant Banner to decorate for the event. The banner is made from an all-weather vinyl material. 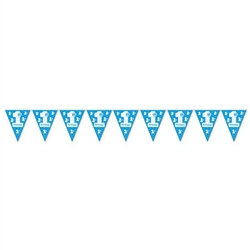 Each 1st Birthday Pennant Banner measures (12) twelve feet long and each pennant represents 1st birthday in colors of blue and white. Take a look at our entire 1st Birthday party selection for great decorations.